This entry was posted in Book Memes, WWW Wednesdays and tagged bad girls don't die, book memes, charlie n. holmberg, diana gabaldon, girl of nightmares, jim stewart, katie alender, kendare blake, lauren oliver, lindsay cummings, ochoco reach, outlander, reinaldo delvalle, rick yancey, the fear trials, the infinite sea, the murder complex, the paper magician, the valentine circle, vanishing girls, www wednesdays by Yvo. Bookmark the permalink. I really need to read Vanishing Girls. Oh and Bad Girls Don’t Die which is coming up soon on my TBR! I hope you enjoy your reading this week! Oh no! I really liked the sound of The Paper Magician. It’s a shame it’s not as good as you’d hoped. I need to read Vanishing Girls too – I was so keen to read it that I bought it on release day and yet still haven’t read it. I’m sure it’ll be a great read, Lauren Oliver never disappoints. Hope you manage to get to read it this week. I have never read any of her work before, so it’s good to know you enjoyed her other work. Vanishing Girls sounds really interesting, but somehow I always end up reading something else instead haha. I think I’ve read all her books and they’ve all been great so I have high hopes for this one. I’m definitely looking forward to Vanishing Girls now. I got my copy of The Paper Magician based on the cover alone; it’s so pretty! The blurb is interesting as well, but somehow the story just doesn’t deliver. I’ve heard other people enjoying it slightly better than I did, but in general reviews have been negative about this one. It’s a shame because the cover and blurb were really promising! 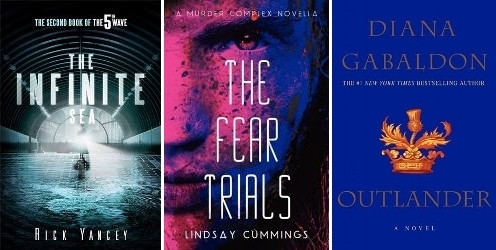 Ooh, a lot of creepy and thriller reads ahead of you, it seems! Vanishing Girls has been on my TBR for a while, I hope you enjoy it once you get around to reading it! Happy reading! Anna Dressed in Blood was so good that I was actually nervous the second one would ruin it, so I never read Girl of Nightmares. I hope you end up liking it and maybe I’ll go back to it at some point! Vanishing Girls is really good in a way that I wasn’t expecting! I’m keeping my fingers crossed Girl Of Nightmares doesn’t disappoint, because I loved Anna Dressed In Blood as well. And it’s good to hear you enjoyed Vanishing Girls! I just added the Kendare Blake series to my list yesterday. Seems like a great Halloween read!! I hope you like the second book! Happy reading! Anna Dressed In Blood was a really good read and perfect for Halloween. Happy reading! Shame that The Paper Magician didn’t live up to your expectations but it still looks like you’ve had a successful week! I really enjoyed The Infinite Sea. I’ve had the Paper Magician on my TBR, but have been going back and forth on whether I really want to read it or not. Since it’s a short read, I may try to give it a chance. I bought the Vanishing Girls when it first came out and still haven’t read it yet! I have been posponing The Infinite Sea like forever, so it’s about time I finally read it. 😉 The Paper Magician sounded so promising, but the story ended up being mostly meh. It started out ok and the paper magic is quite interesting, but the plot itself is pretty weak. It is quite a short story though fortunately. Also been thinking about reading the Paper Magician but may move it down the list. Thought about trying them too but think I’d need a buddy again. Did you enjoy them? I’m having mostly mixed thoughts… I do love the story, but sometimes the descriptions are so long and there are so many different characters that it becomes confusing. With each chapter focusing on a different character it’s quite easy to read it in between other books though… That’s how I finish the last two, and I’m still deciding on when to start the fifth. I find if done well fantasy does often work better on screen but then I often struggle to picture things described in books. Some fantasy books definitely work really well on screen! I hope you’re able to finish Outlander soon. It’s quite a book, I had to resort to the audiobook to get through it. Happy reading and thanks for participating in WWW Wednesday!